One of my biggest financial mistakes was buying a home that was too big for our family. Well, actually my wife and I buying a home that was too big. We purchased our house almost 10 years ago, by taking out a 30 year fixed rate loan. After about 2 years of owning our home, interest rates started to come down … so we refinanced to a lower rate. Refinancing saved us a couple hundred bucks on our monthly payments, but we still had a bit of a problem. As our family grew to 3 children, we quickly realized that we bought way too much house. Our house is 3,362 square feet, with 5 bedrooms and 2.5 baths. We can afford to pay our mortgage every month. And our property taxes, insurance, maintenance, utilities, and every other expense that goes into owning a home. But if we would have been a little bit smarter … we could have purchased a smaller home. For example, we recently calculated that buying a 2,500 square foot home in our same neighborhood would have increased our net worth by over $400,000 in 30 years! A 2,000 square foot home could have increased our net worth by over $615,000 in 30 years! A note to my children (if you ever read this someday) … don’t buy a home that is bigger than you need just because you can afford it. Go with a smaller (more manageable) home and you will grow your net worth a lot faster than we did. 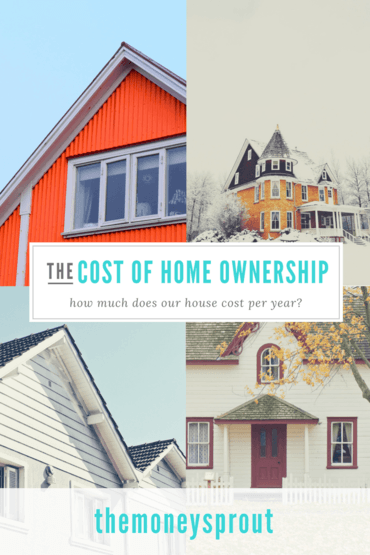 What About Other Costs of Owning a Home? Even crazier is those calculations I ran before only considered the down payment on our home and the monthly mortgage payments. I never even factored in the other costs of owning a home! Buying a smaller home (in our same neighborhood) would have given us smaller mortgage payments and less of a down payment. But it would have also resulted in lower taxes, homeowners insurance, maintenance costs, and monthly utilities. Pretty simple when you think about it … fewer square feet means less costs to heat our home in the winter and cool it in the summer. A smaller home in the same neighborhood likely will decrease our property taxes. And I am fairly certain our homeowners insurance would be cheaper too. A smaller home could have meant having only 1 furnace … instead of 2 that we have now. We may have only needed 1 central air conditioning unit … instead of 2 that we have now. Less home equals less problems and expenses! 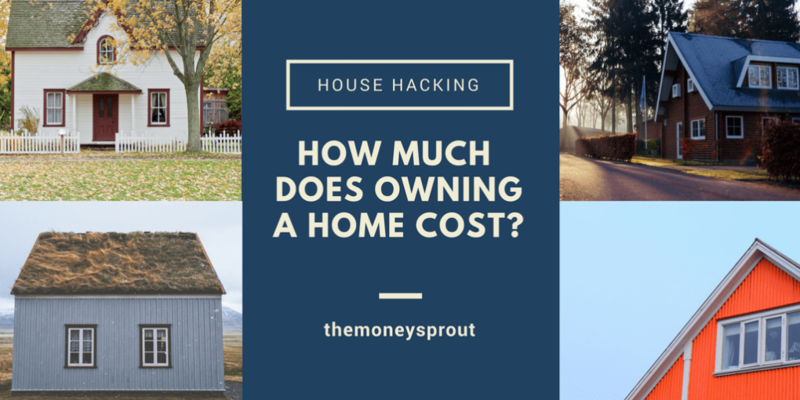 How Much Does Our Home Cost per Year? It is pretty simple to calculate how much we pay on our mortgage each year. But what about all the other costs involved? At the end of last year, I decided to break down all of our expenses into different categories to see where our money is going. As a result, I was able to get a breakdown of just how much we spent last year (2017) for housing. Not surprising, but our mortgage made up the largest expense category last year for housing. Next on the list was our property taxes … which came in at almost $4,000. On a good note, we were able to leverage our property taxes into earning a bunch of future free travel. Utilities were third on our list of housing expenses. This includes basic necessity’s to live in a functioning home – heat, electricity, and water/sewer. Our trash and recycle service is included as part of our taxes. We also had a couple thousand dollars in general maintenance. Biggest on the list was 2 separate repairs to a furnace. 10 year old homes tend to have things go bad after a while. Finally, we paid almost $1,000 for our homeowners insurance and another $172 in HOA fee’s. Overall, we paid $22,639.17 to live in our home last year. That averages out to $1,886.60 per month. That monthly total comes out to 37.7% of our average take home income. We try and budget for $5,000 of spending (take home pay after taxes) each month. Anything leftover is always invested. So as you can tell, housing makes up a huge chunk of our monthly spending. Whether we have a mortgage or we rent a house, our family needs shelter. So unless we decided to buy and live in an RV … we need to either rent or buy a home. Back 10 years ago … my wife and I chose to buy our home. We also chose to buy our first home (which was much smaller) after we got married. And while there seems to be constant debate in the financial independence community about buying versus renting … I can see the benefits of both. My wife and I tend to value stability and owning a place we can call home. So for us … buying a home provides value for our family. Now that we have calculated our average monthly housing spend ($1,886.60) … I would be interested in comparing the cost of renting in our location. I have a very strong feeling that it is actually cheaper for us to own (right now) than rent … at least in our neighborhood. When it comes down to it … I don’t know if we would have saved any money by renting instead of owning our home. I think the numbers over the past 10 years would have been very comparable. And if you throw in the ability to deduct property taxes and mortgage interest on our federal taxes (not in 2018 though) … owning may actually have been the smarter choice. What we have realized though is that renting probably wouldn’t have saved any money … but buying or renting a much smaller home would have. As our kids are growing older, my wife and I are now putting together a plan to eventually downsize within the next 5 years. Not only will we not need the space we currently have … but we will likely need even less as the kids move on to college eventually. Avoiding housing costs is unavoidable in my opinion. Finding a way to minimize those costs is the best solution to keep expenses to a minimum and allow you to build wealth at a faster rate. My wife and I did not optimize our housing the best that we could have. But we want to pass along these lessons learned to our kids and anyone else out there who wants to listen.